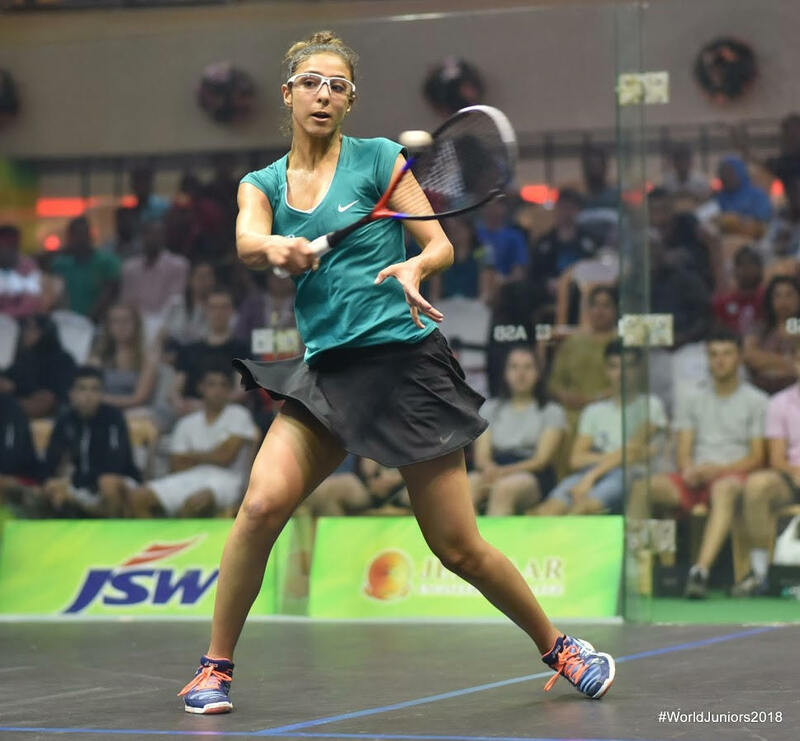 Araby had lost to her compatriot Hania Hammamy on the previous four occasions - and trails world No.20 11 positions in the PSA World Rankings. 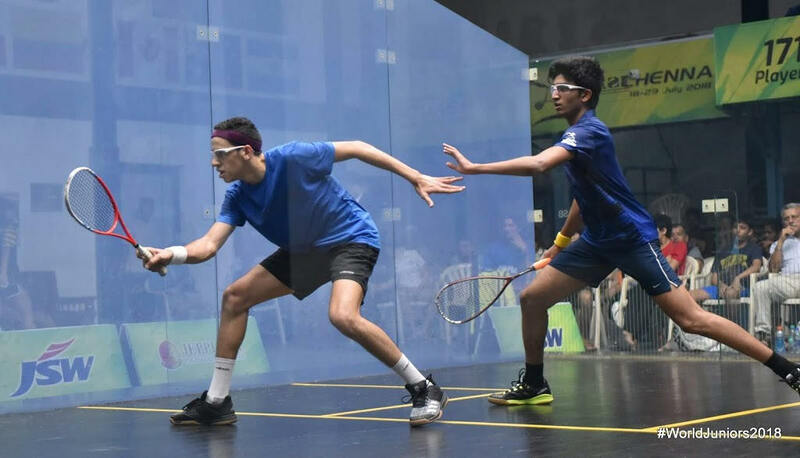 Their encounter in the final was a repeat of their 2016 semifinal and 2017 final - both won by Rowan - and it was the defending champion who got off to a flying start, pulling away to take the first 11-4. 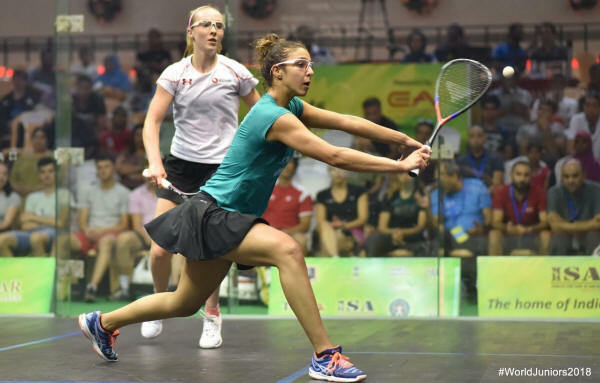 Hania held the lead for much of the second, but Rowan finished the stronger to double her advantage 11-9. 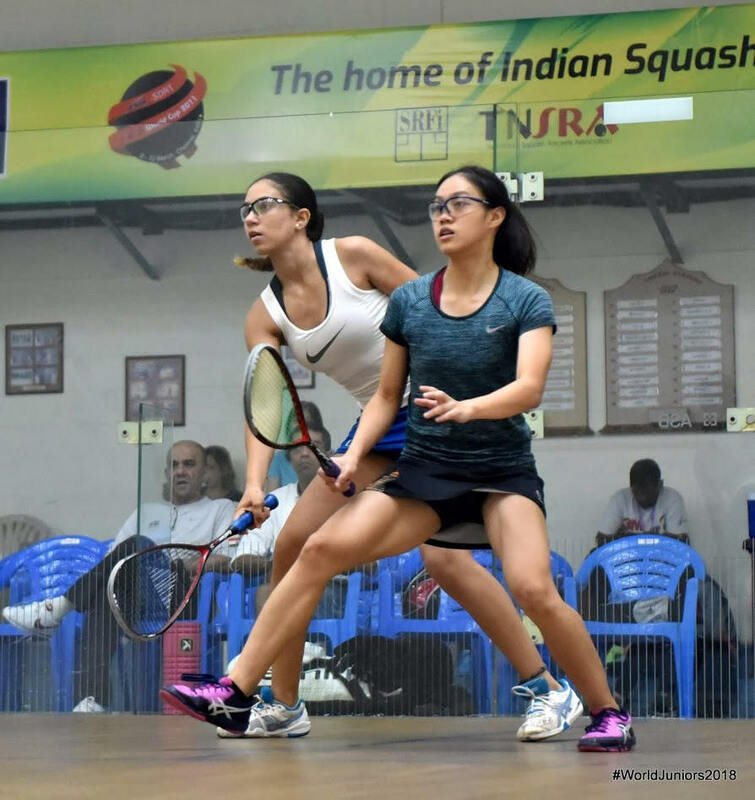 Rowan led to midgame, then Hania pulled away to lead 9-7. 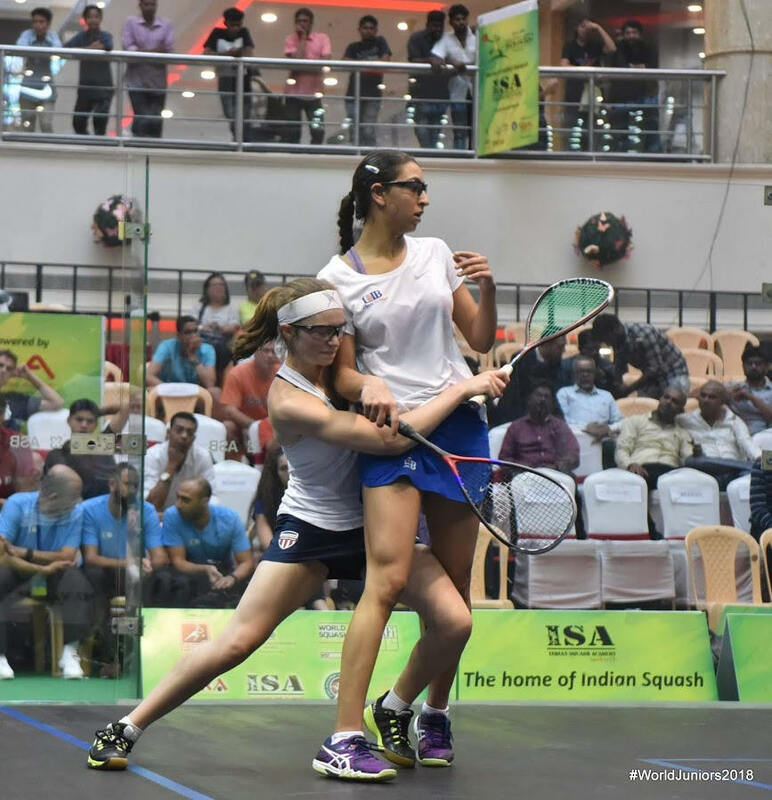 Now it was Rowan's turn to recover, and this time she only needed one chance as Hania's ball flew out of court and Rowan was still the champion. 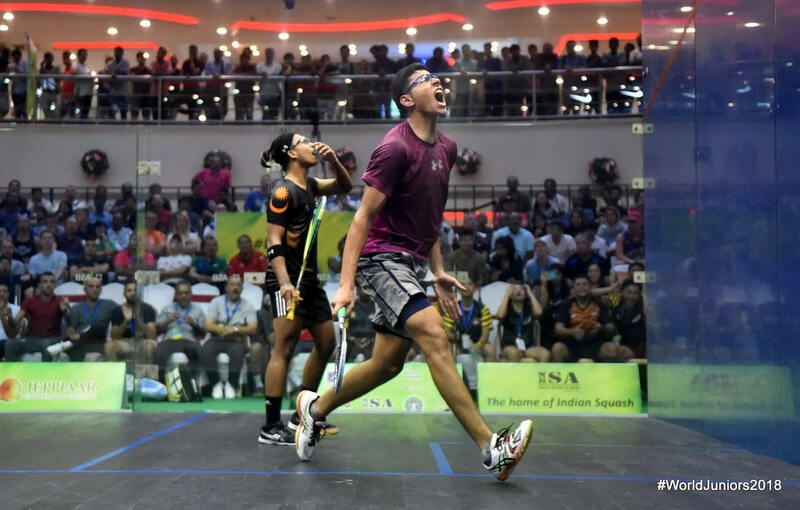 The men's final also featured the defending champion, Marwan Tarek taking on second seed Mostafa Asal, who had gone out in last year's quarters but after winning a trio of PSA tournaments and te Egyptian National junior titles (U17 and U19) came in as the highest-ranked player and probably the favourite. 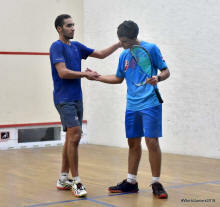 It looked that way in the first as Mostafa led throughout to take the lead 11-7. 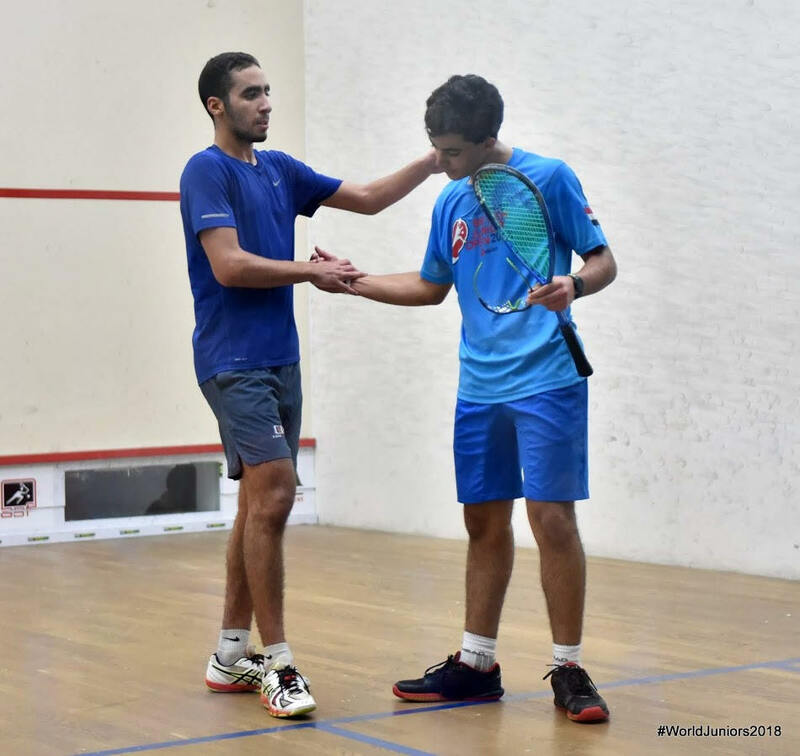 The second was closer, and it was Tarek who moved ahead in the later stages, but couldn't convert his two game balls as Mostafa took it 13-11. "It feels amazing, I'm so happy ! That was my last World Juiniors and if I hadn't won I know I would have been so sad. 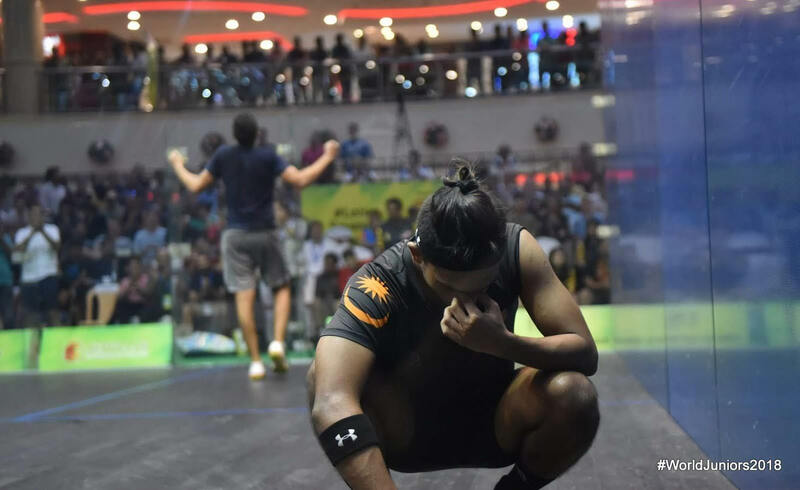 "When I got four match balls in the third I started thinking about my birthday, about celebrating with my friends, I just freaked out and went completely out of the court. "I knew I had to get back to my game plan and concentrate all the way in the fourth. I almost lost that too, at 9-7 down, I fought really hard to try to make it not go to five. 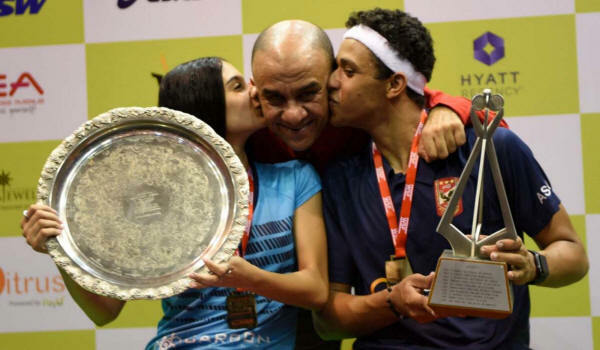 "Looking at the players who have won it twice, Nicol, Ramy, Raneem, Marwan, and especially Mohamed, he's my role model, I cant thank him enough, he's helped me so much and is always there for me. 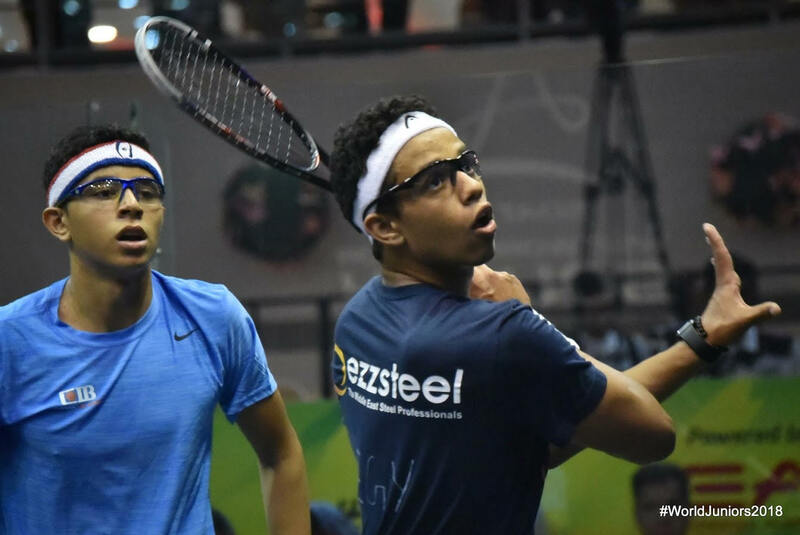 "That may be my last junior match, it depends on the British next year, but if it is my last I'm happy to finish with that one!" 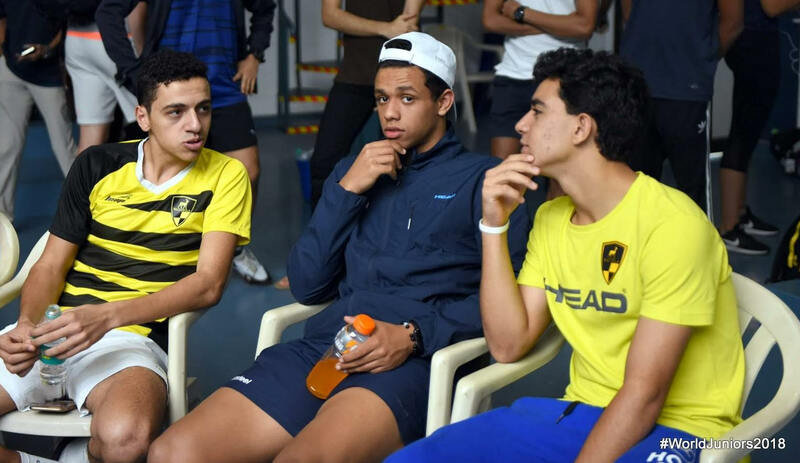 "Thanks to Marwan for all the battles we had in Egypt, and I hope he has a great time in Harvard, he'll miss us in Egypt! 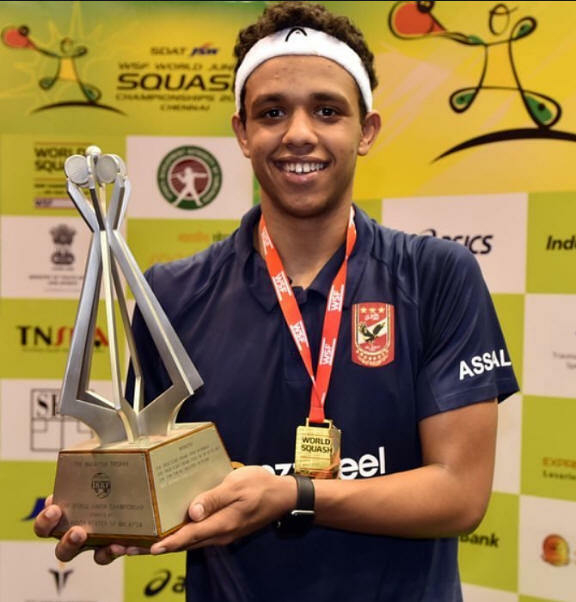 "I'm overjoyed to become World Champion, it's great that we had two all-Egyptian finals. 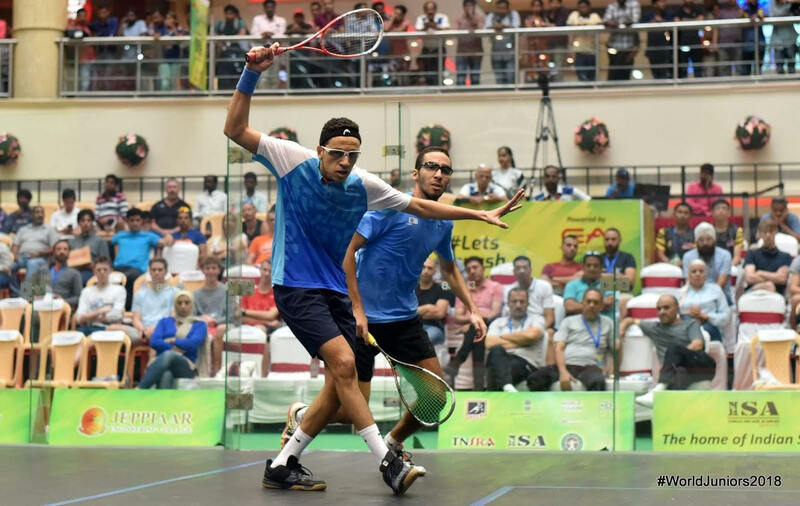 "I went into the match with confidence knowing I'd won in Egypt, but I really had to fight hard in the second to keep the momentum going. 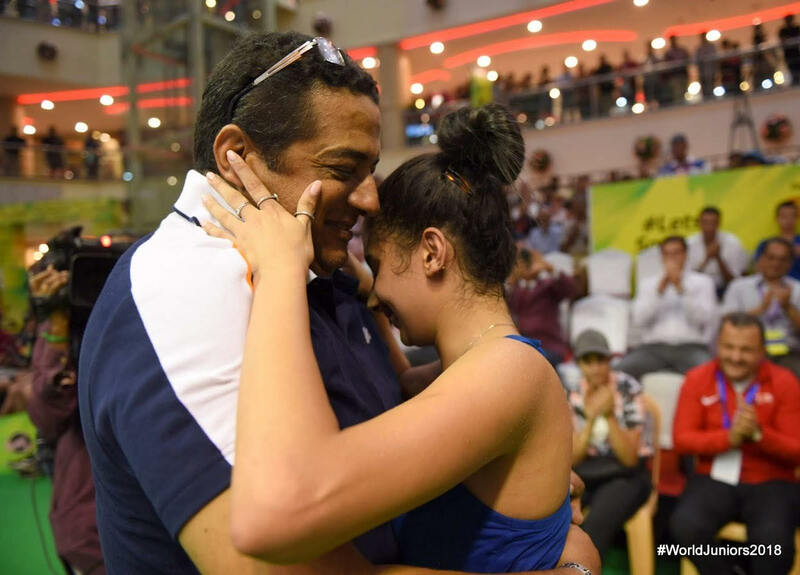 "Thanks also to my coaches and family, and everyone wo's supported me, and especially Shaza Tamer. 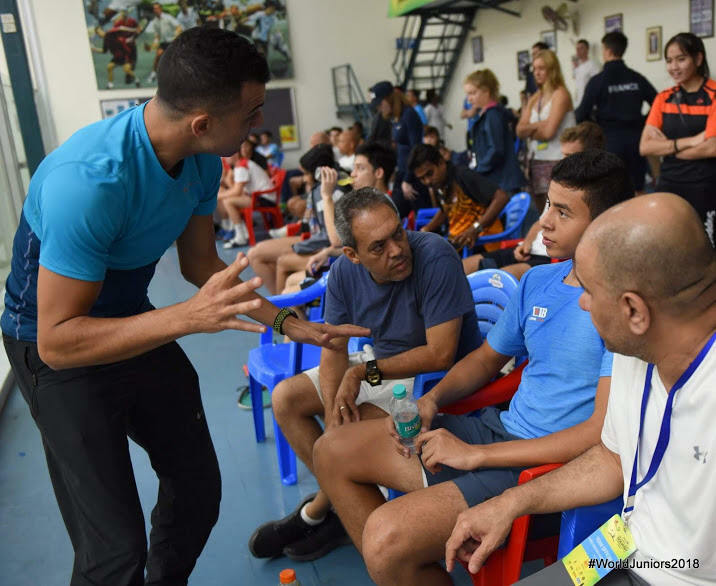 "On to the teams now, let's hope we can get that title back for Egypt." 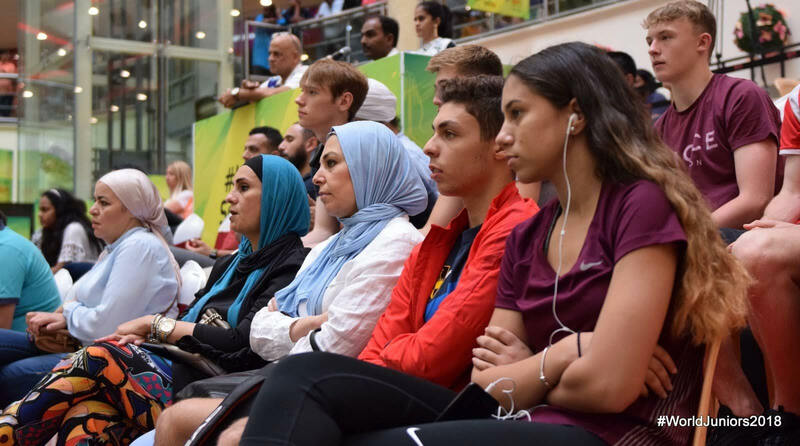 The top seeds in the Men's and the Women's events will contest the finals of the WSF World Juniors after today's semi-finals at the Express Avenue Shopping Mall in Chennai produced four Egyptian winners. 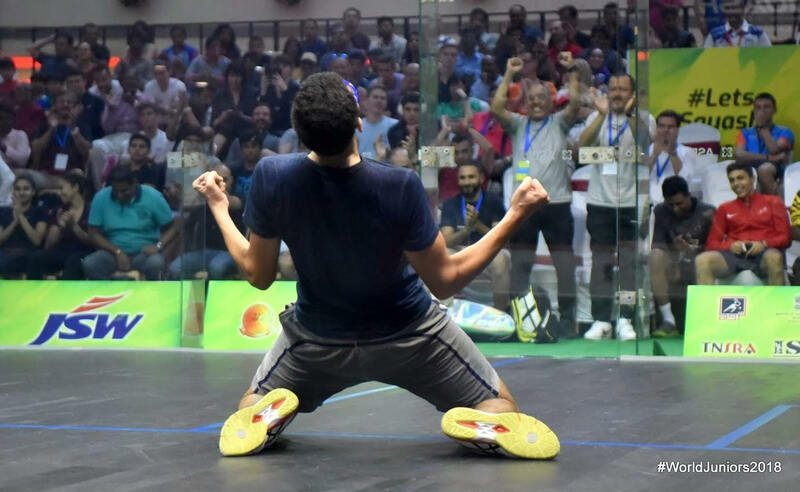 Men's defending champion Marwan Tarek was fully tested in "the longest match of my life" by compatriot Omar El Torkey, the top seed looking on his way out at 8-4 down in the decider before scoring seven points in a row to return to the final. 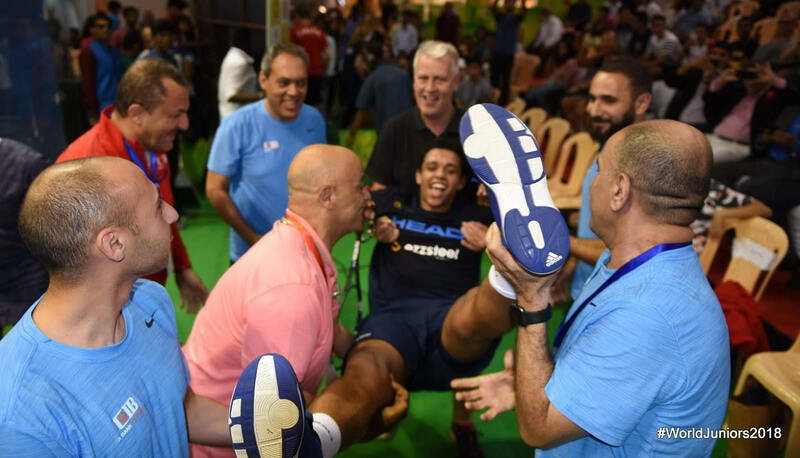 The match lasted a marathon 92 minutes - not including a 25-minute break early in the first while court lights were repaired - as they traded the first four games before the tense ending. 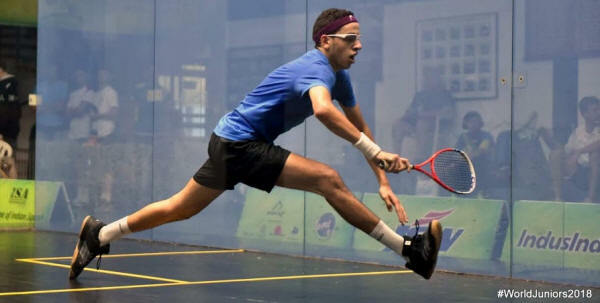 Second seed Mostafa Asal had the highest PSA ranking of those here -partly because he's played more tournaments - but that experience in the senior ranks seems to be paying off as he too registered another three-nil win, over 3/4 seed Mostafa El Serty. None of the games were easy, but Asal rarely looked in trouble. 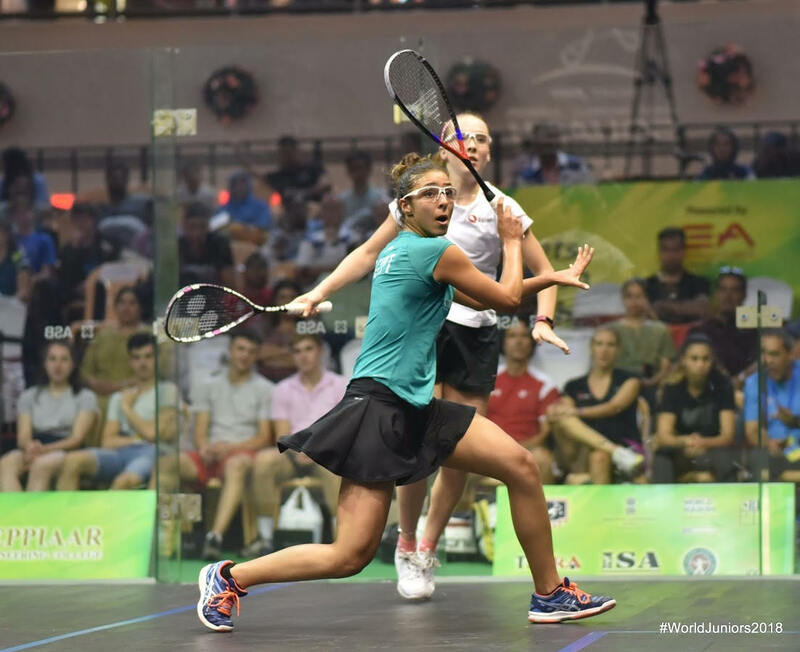 Women's defending champion and top seed Rowan Elaraby continued her run of straight-game wins, but as in previous matches this wasn't a simple three-nil. 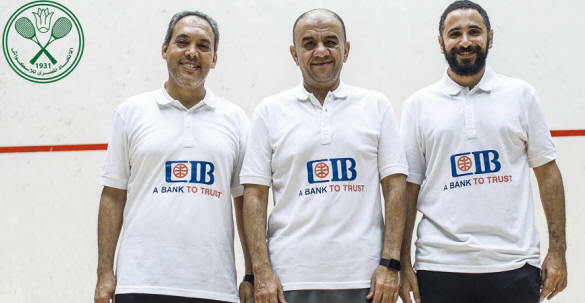 Jana Shiha led early in the first before Elaraby stamped her authority to take the lead, and led in the second too before Elaraby once again accelerated to take a 10-7 lead. Shiha saved those game balls, had one of her own, but couldn't stop Elaraby doubling her lead. 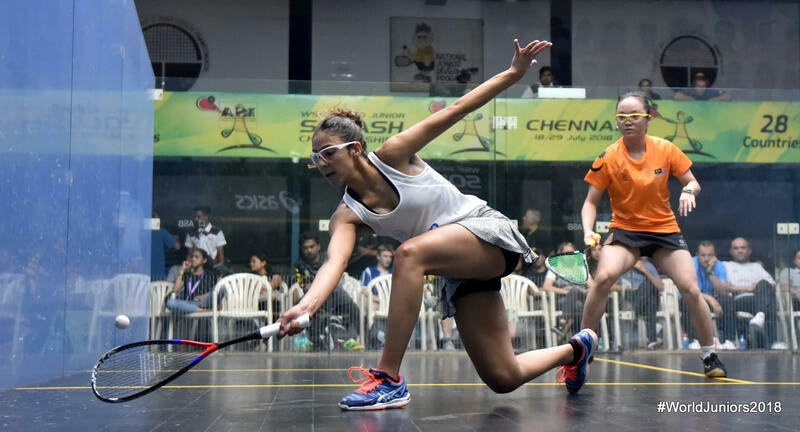 The last semifinal featured the only non-Egyptian player of the day, and England's Lucy Turmell hinted at an upset as she levelled the match at one-all agaisnt second seed Hania El Hammamy, making that the only game Hania lost since the begining of the event. 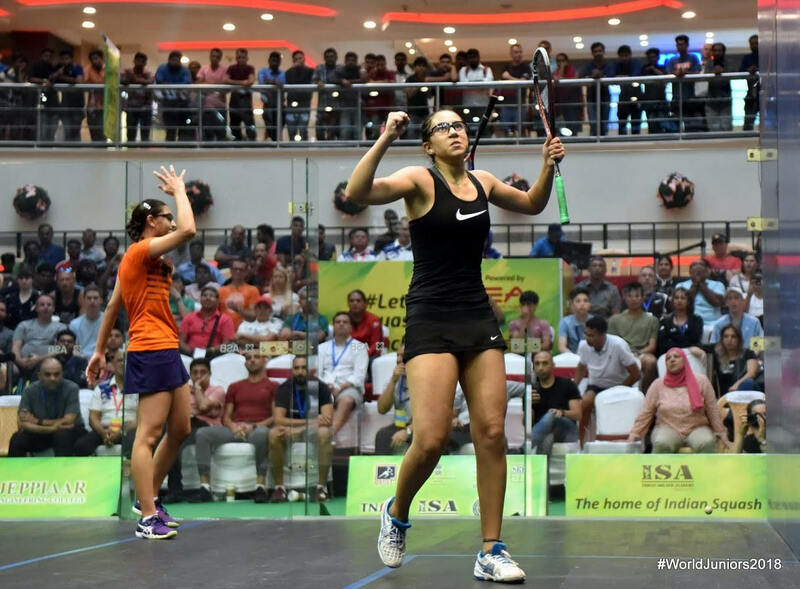 The World #20 quickly slammed the door on that possibility as she took the last two games comfortably to reach her second final in a row. 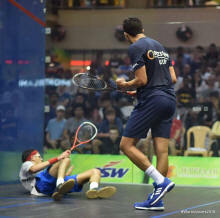 "This was the longest match of my life!! 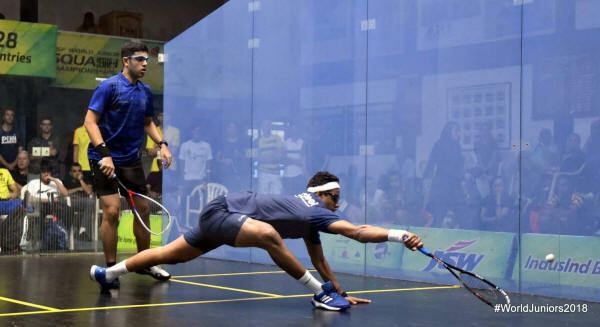 "I was three points from going out of the tournament. 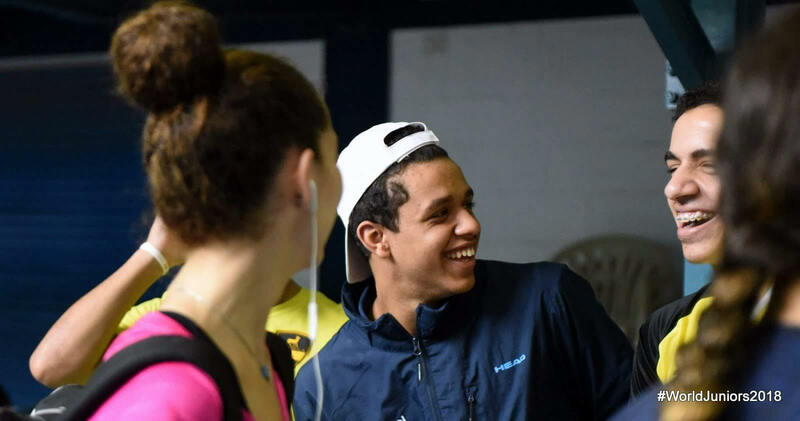 It was long and tough but I don't regret that, it's the semifinals of the World Juniors. 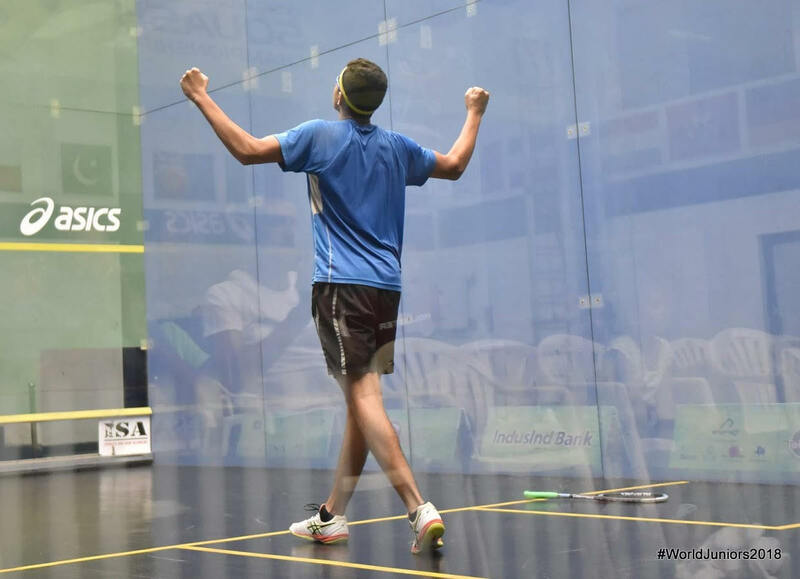 "I felt he got a bit tired early in the fifth but he still went ahead. I started thinking about anything but the match and took it point by point. 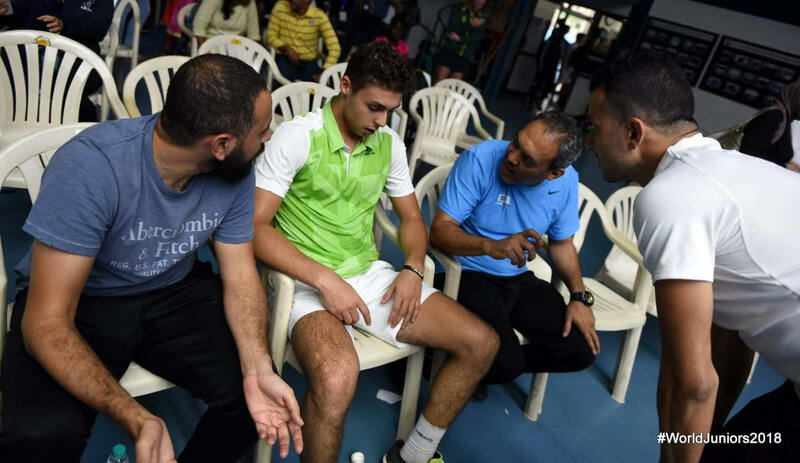 It feels good to have survided that and reach the final again, I hope I'll play a good match tommorow, let's see how it goes ..."
It wasn't easy but I never felt in real danger. I won the Egyptian U17 and U19 titles with 3-0 wins all through so it's nice to keep that going! "Tomorrow it's mental, whoever's mentally strongest will win it." "It's always the second game. 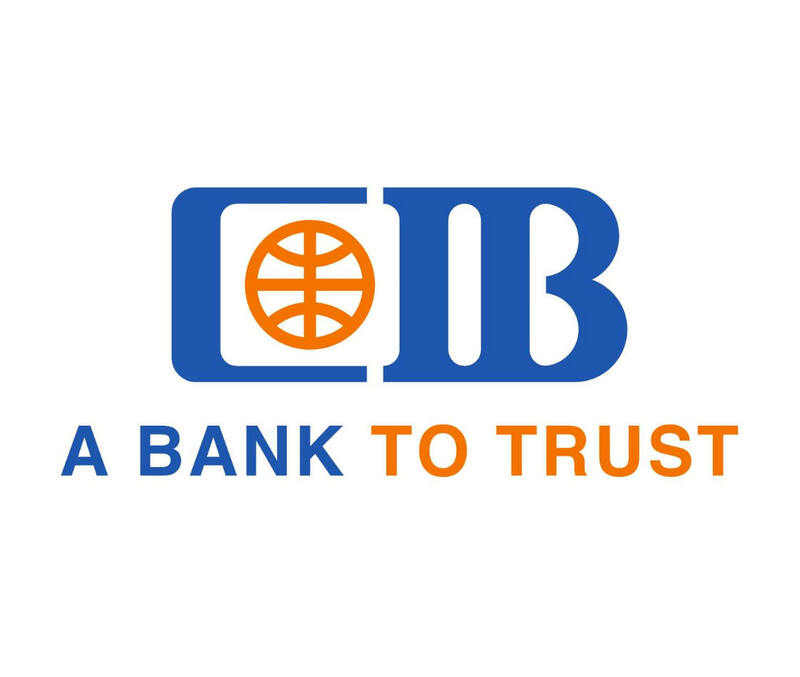 "I had no pressure in the first, but I started to feel it in the second. 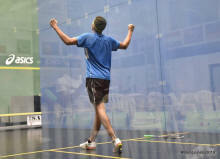 I wanted to win that one, I didn't want a long match if I was to get to the final. 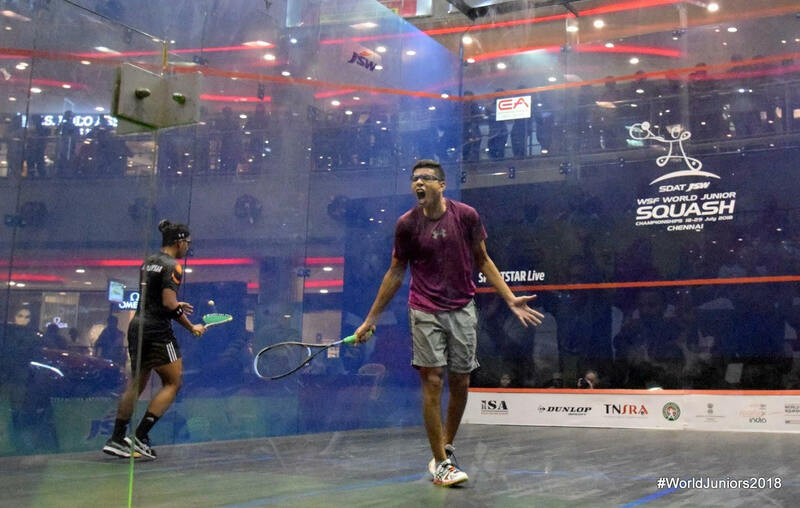 I was so happy to win that second, it took the pressure off. 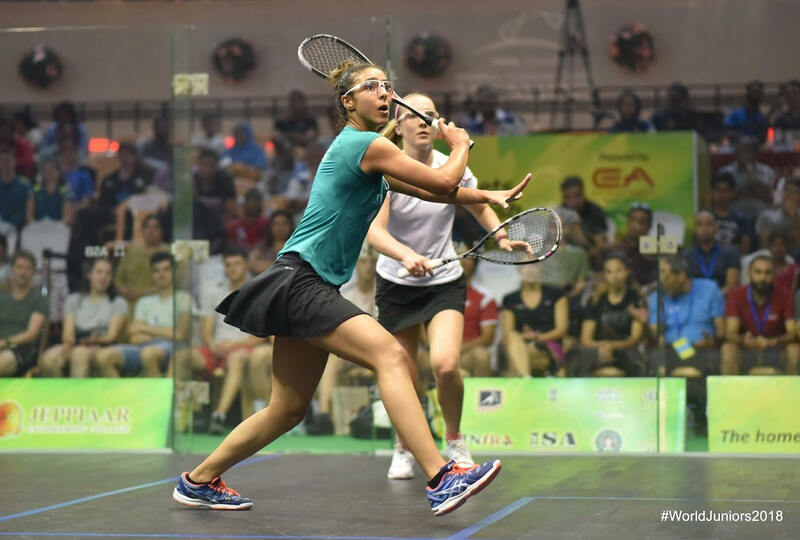 "I'm pleased to make my third WJ final, and obviously hoping to keep the title." 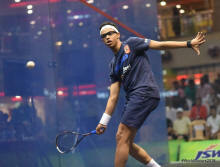 "So happy to be in the final again. 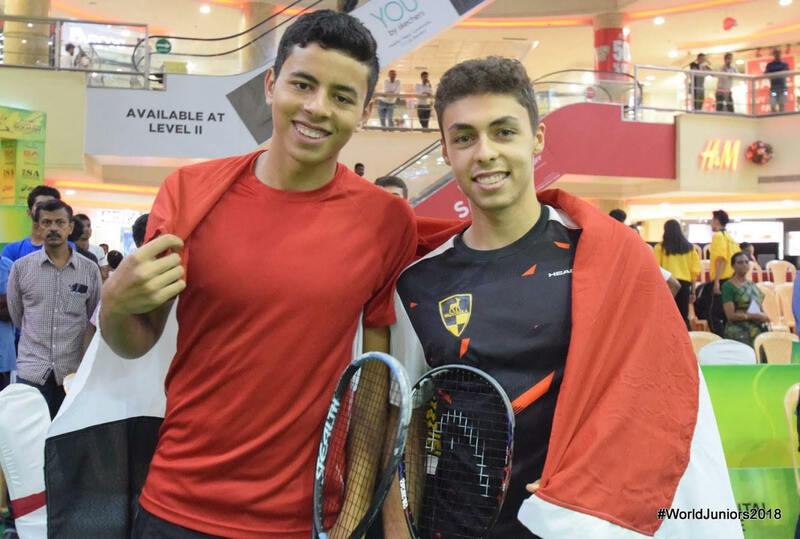 "I'm really enjoying the atmosphere in the Mall, and I'm really looking forward to a good match against Rowan tomorrow." 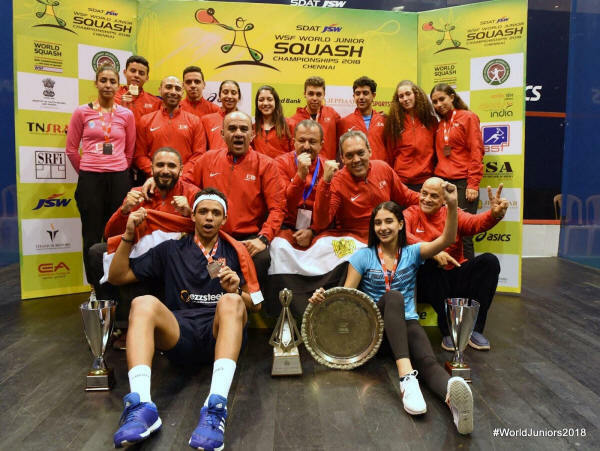 It was a great day for Egypt at the Express Avenue Mall in Chennai as they claimed seven of the eight available semi-final places in the 2018 WSF World Juniors. 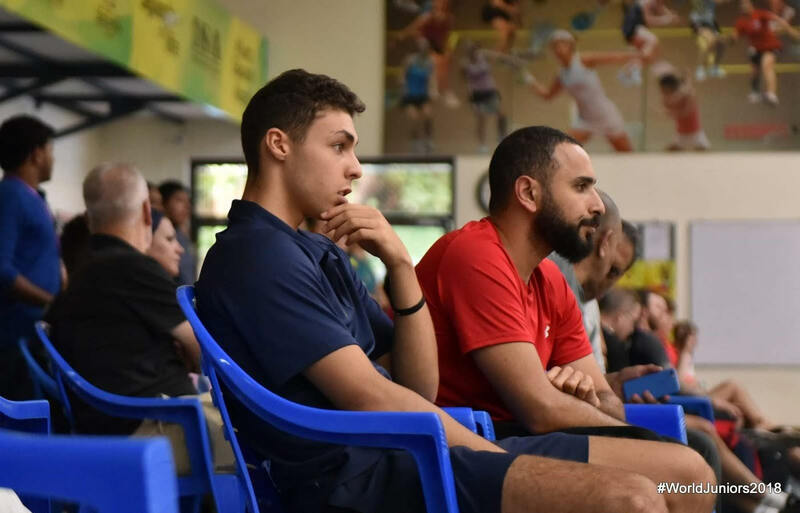 Top seeds and defending champions Marwan Tarek and Rowan Elaraby started the Egyptian Express Train rolling as they recorded strait game wins over compatriots Mostafa Montaser and Hana Moataz, both being tested in the first game before accelerating through to the semis. 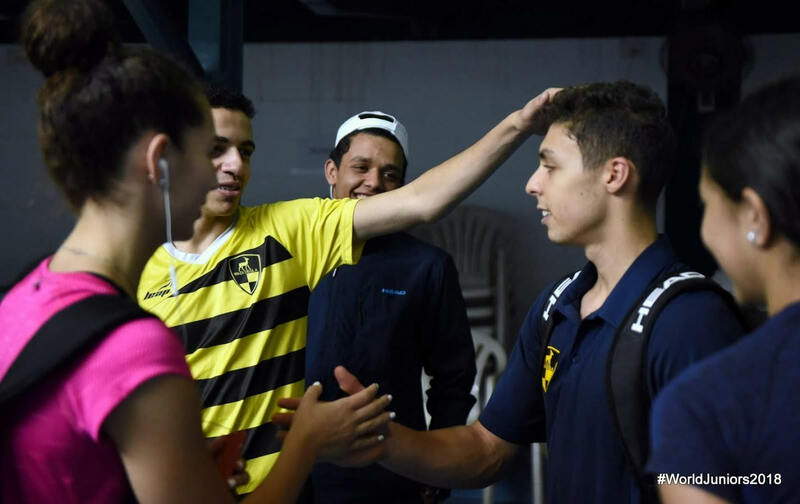 Two more Egyptian wins came as men's 3/4 seed Omar El Torky and women's 5/8 Jana Shihah won in contrasting styles. 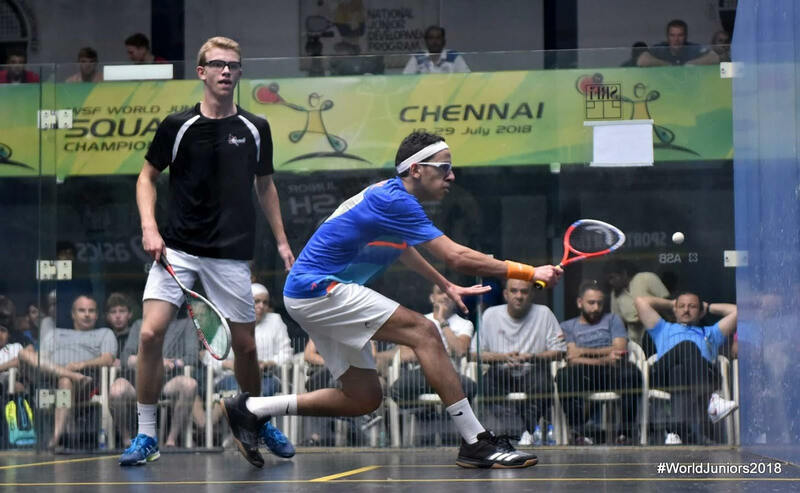 After a cagey opening El Torkey raced through to earn a two game and 9-3 lead against England's Nick Wall, who closed the gap but it was too laste to affect the outcome. 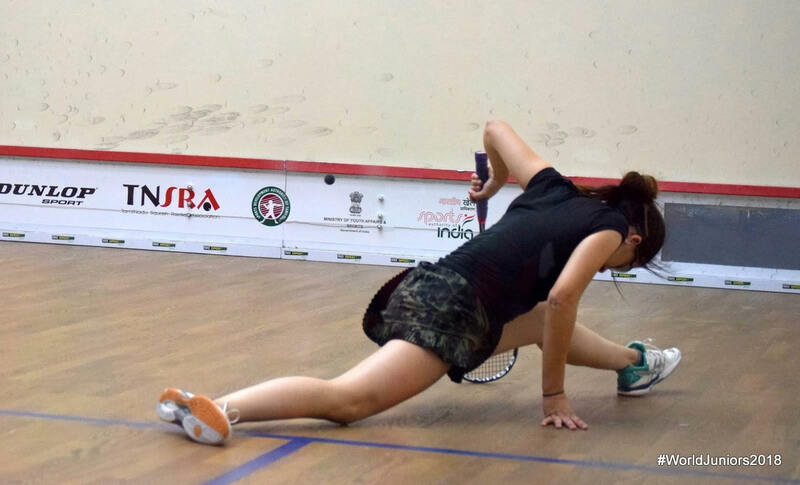 Shihah survived a torrid five setter against Farida Mohamed, who had taken out 3/4 seed Aifa Azman in five yesterday. 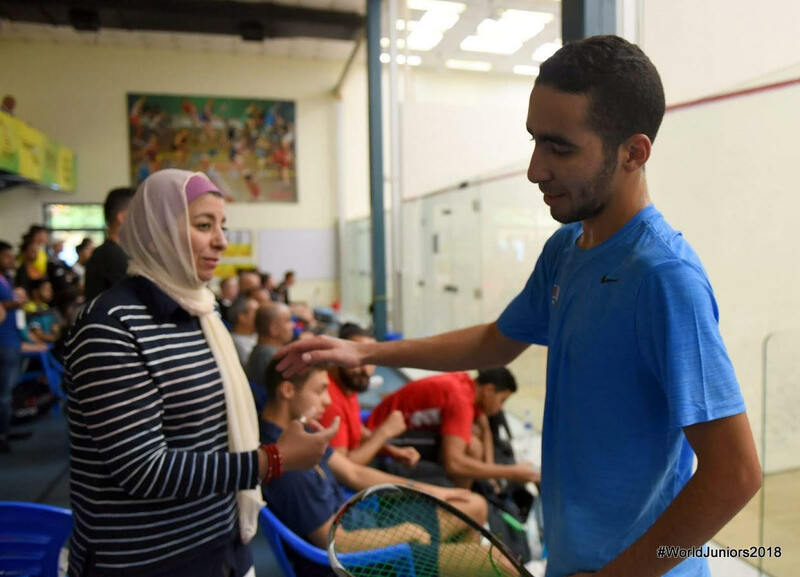 The first four games were shared before Shihah saw a 10-7 lead in the fifth disappear, and saved a match ball herself before finally closing it out. 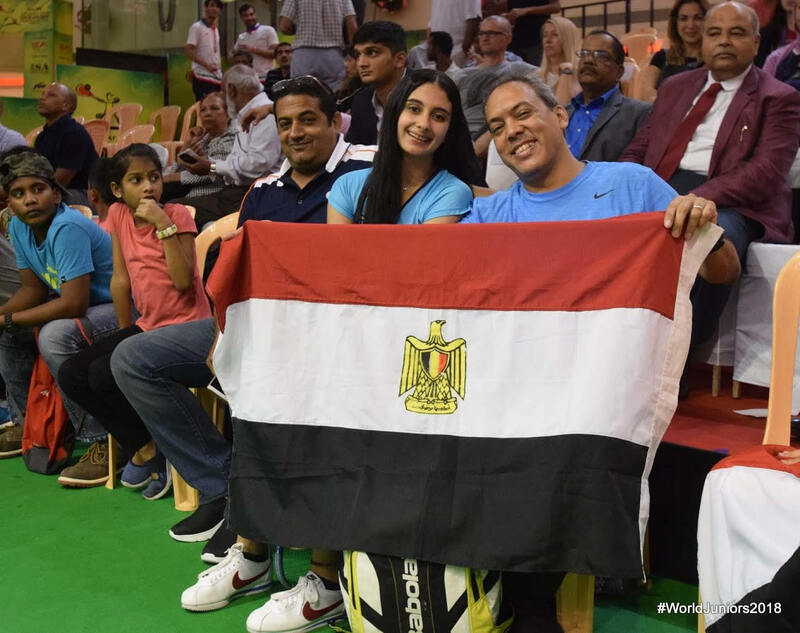 The opening four matches guaranted Egyptian finalists in the top half of both draws, and Mostafa El Serty made it five for Eypt as he survived in five against Darren Rahul Pragasam. 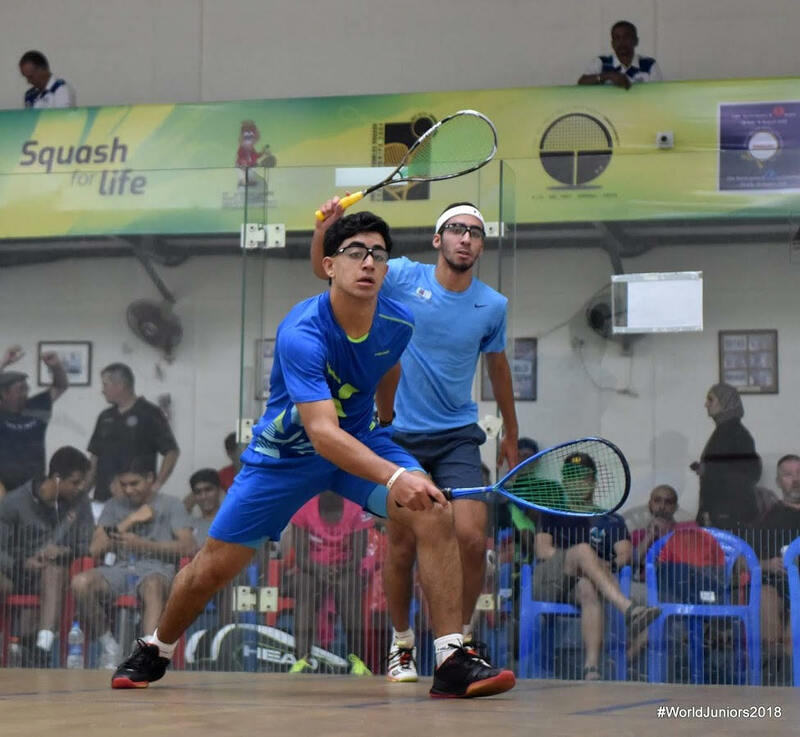 The Malaysian started brightly, and at 2-1 and 10-9 he held a match ball only to see El Serty take the next three points and close out the fifth. 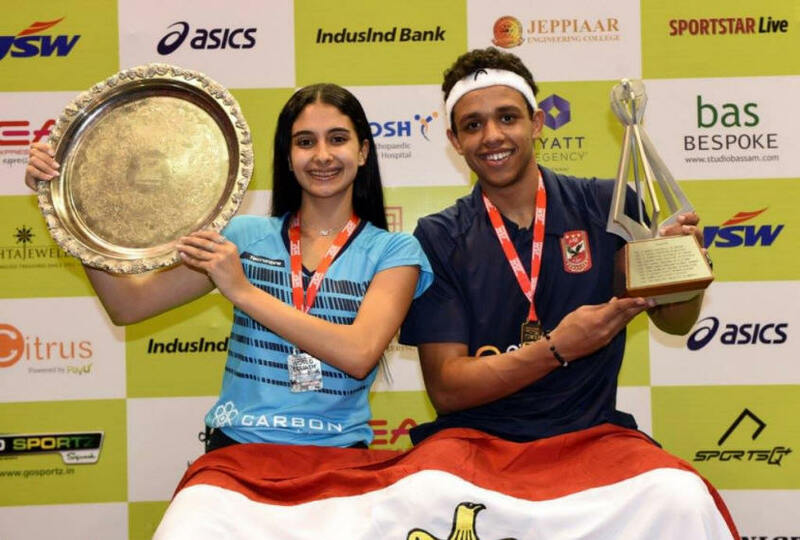 The final pair of matches featured second seeds and the highest PSA-ranked players in the tournament, Mostafa Asal and Hania El Hammamy. 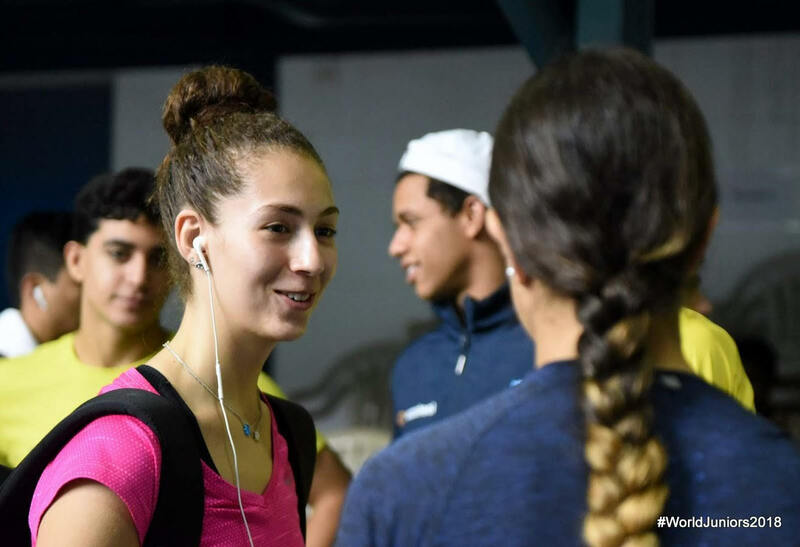 Both won in three games, but Asal needed to recover from 7-10 in the first before beating Mexico's Leonel Cardenas in tree close games, while Hammamy, like Elaraby reaching her third WJ semifinal in a row, eased past USA's Marina Stefanoni. 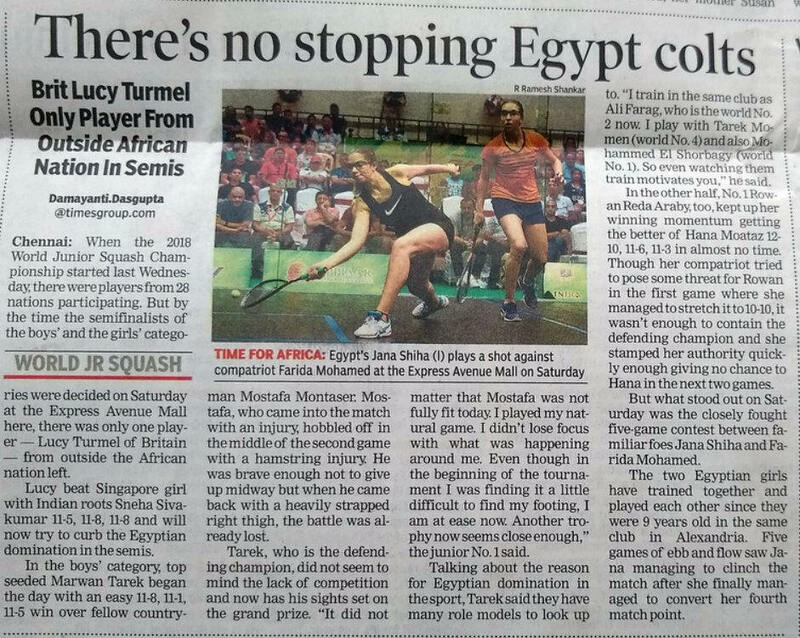 The Egyptian train was stalled, if not derailed, as England's Lucy Turmel beat Singapoer's Sneha Sivakumar, the only unseeded player in the quarterfinals, in straight games. 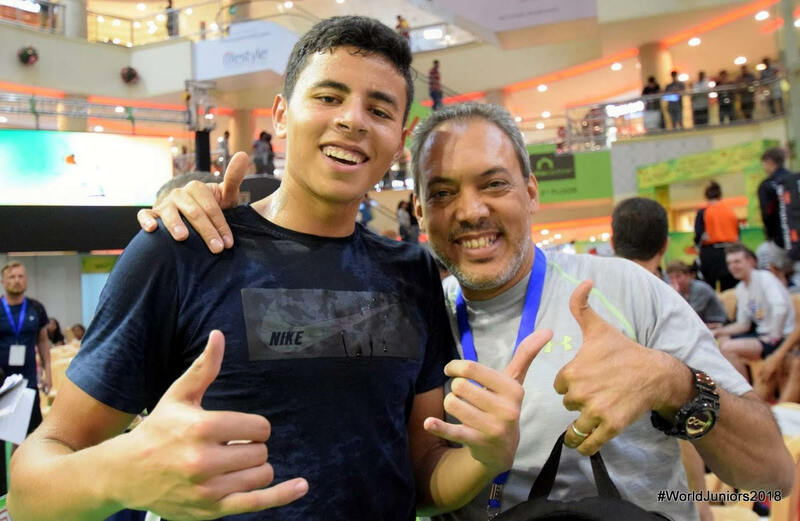 "It's great playing in the Mall, even if I was playing one of my best friends. 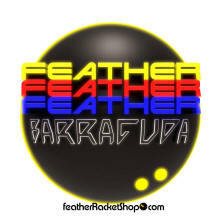 I'm happy with how I played and feel I'm getting better each round." 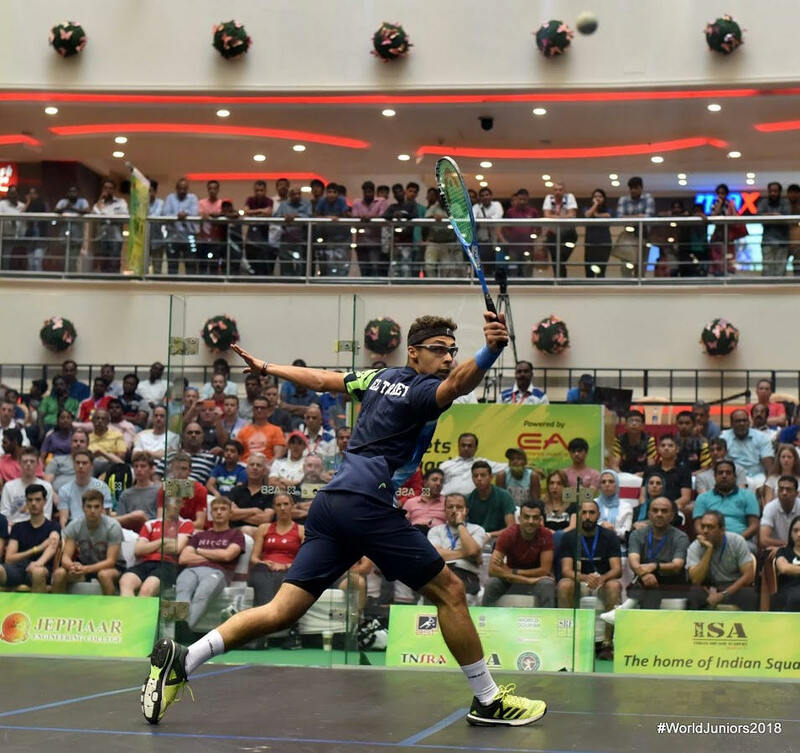 "I didn't want another long match like my last ones, it's always a good match aginst Nick but I felt comfortable, I don't know what happened at the end when I gave away so many points but thank God I made it through!" "I thought I'd lost the first. 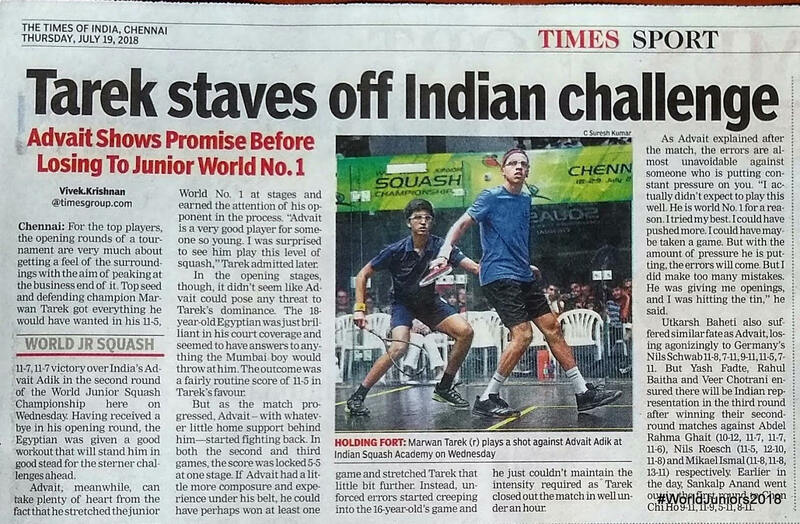 I played him in the semis in Argentina so I knew it was going to be tough, he plays like a PSA player not a junior. "I had a plan, but it was hard to put it in place, I'm just glad to et trough in three." 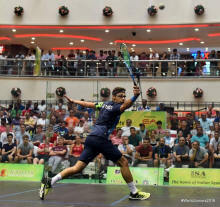 "I really enjoyed playing here, I loved the crowd watching from all around. 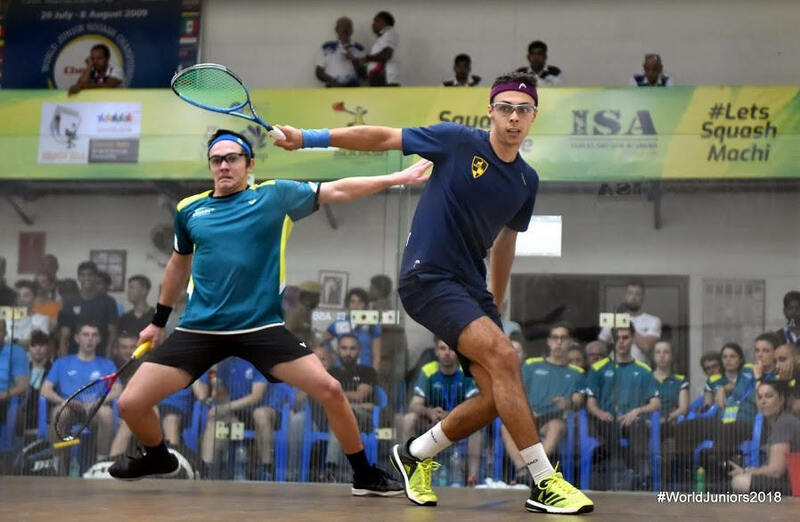 "There was a bit of pressure when I was down in the first but I managed to get trough it and I'm really pleased to make a third semi in a row." 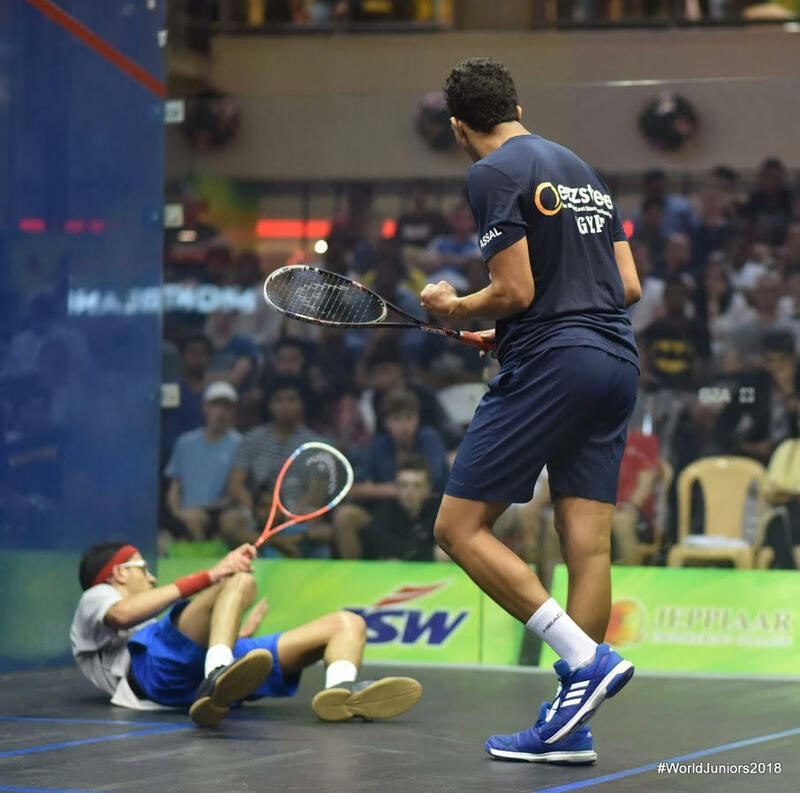 "It's great playing in this venue, but it didn't feel so good when it got tight in the fifth! 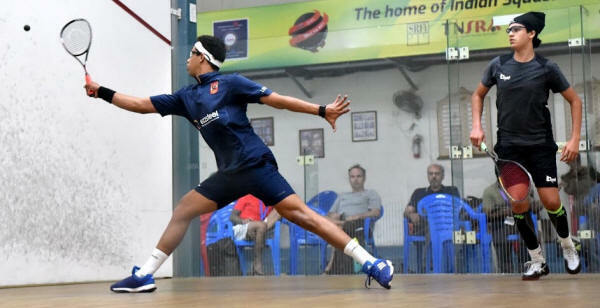 "Farida and I have played probably 50 times since we were 9, in the semis and finals of events even when we're playing up an age, so we both knew it was going to be tough." 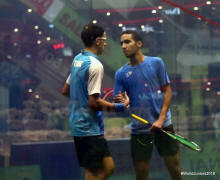 "I'm happy with my performance, especially against such a talented player as Marina. She was pushing me to the front so I was happy to get to every one. Another semi, hopefully I can go one better this time." 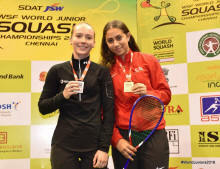 Top seed and defending champion Rowan Elaraby was untroubled as she eased past Malaysia’s Chan Yiwen in straight games. 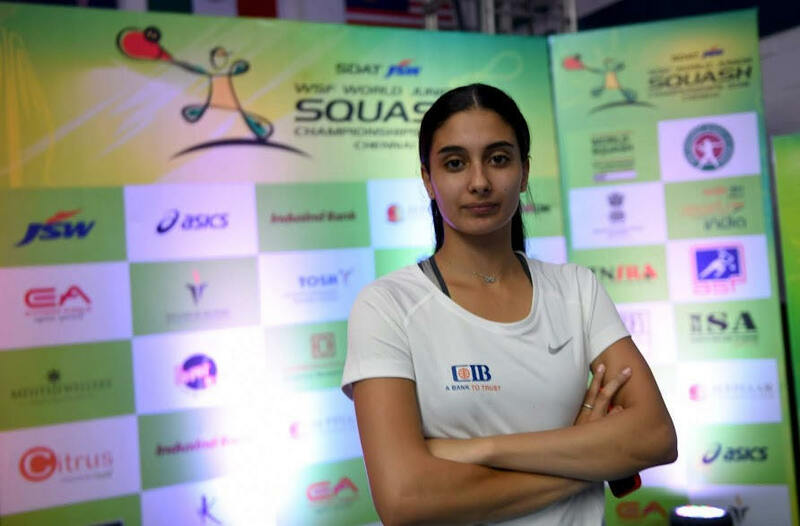 She’ll meet compatriot Hana Moataz on the glass court at the Express Avenue Mall for a place in the semis, Moataz beating England’s Alice Green in straight games. 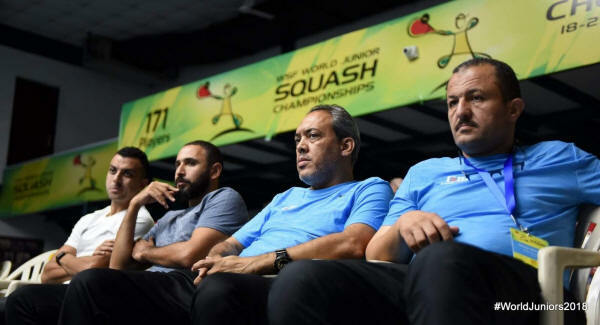 Whoever wins that, they’ll face more Egyptian opposition as Jana Shiha and Farida Mohamed meet for a last four place. 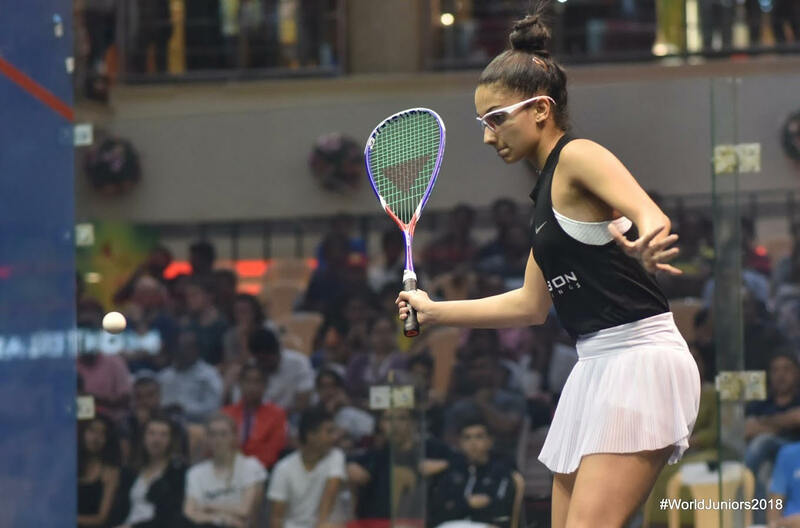 16 years old Farida Mohamed, a 13/16 seed, produced the day's biggest third round upset at the Indian Squash Academy when she defeated Malaysia's 3/4 seed Aifa Azman to ensure an Egyptian finalist in the women's event. 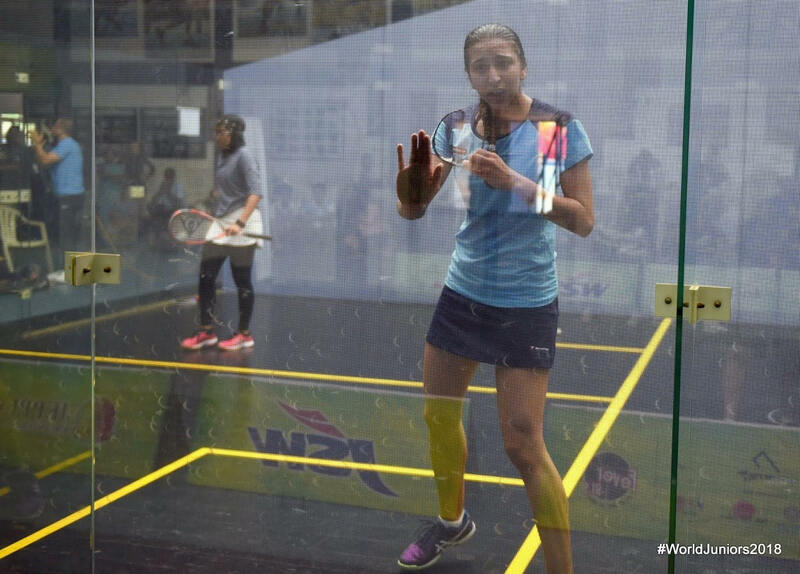 Mohamed – younger sister of 2014 WJ Champion Habiba – ousted 3/4 seeded Malaysia Aifa Azman in a five-game battle. 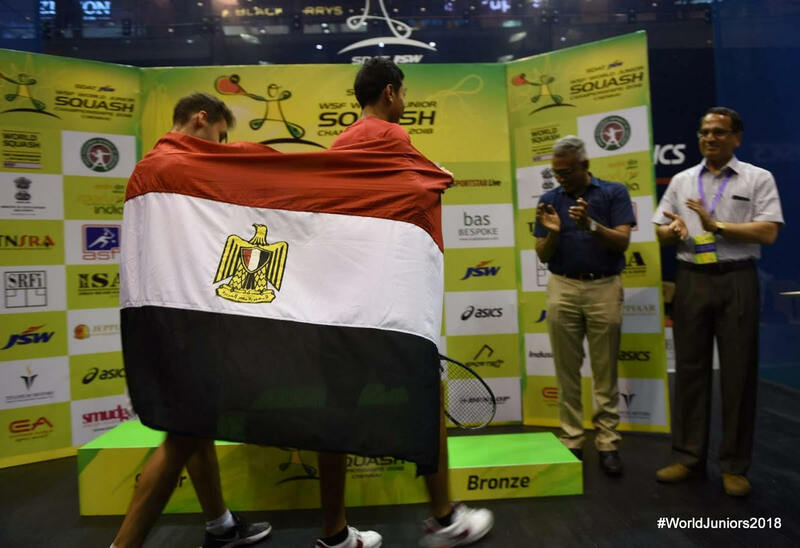 The Egyptian could easily have won 3-0, leading 10-6 in the first and taking the second and third games boty to seven. 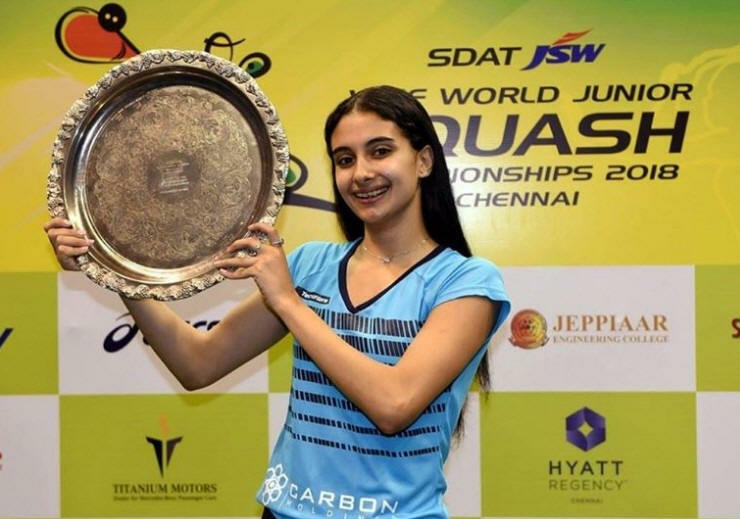 Azman, the BJO U17 champion, snatched the first 17-15 and levelled convincingly in the fourth, but it was Farida who delightedly took the decider. 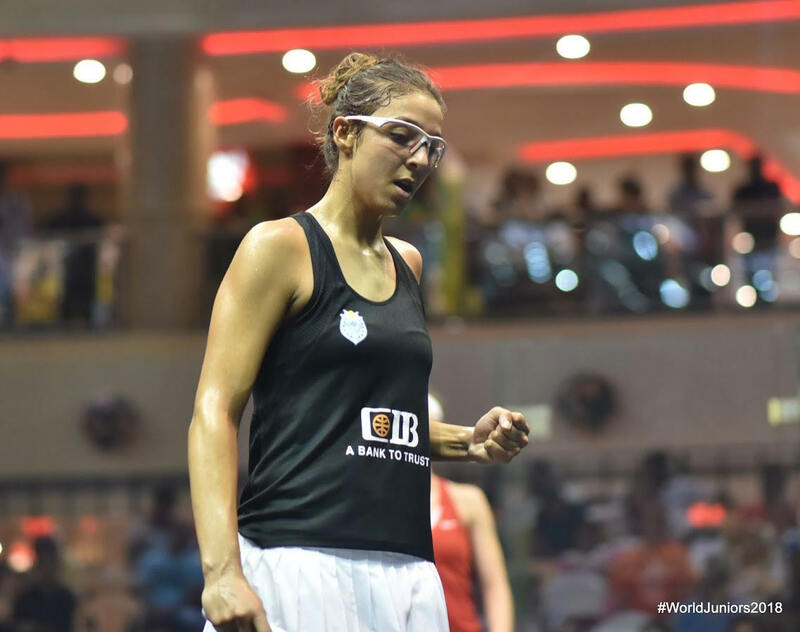 In the bottom half of the draw second seed Hania El Hammamy is the lone Egyptian, after beating Malaysia’s Kah Yan Ooi in three close games. 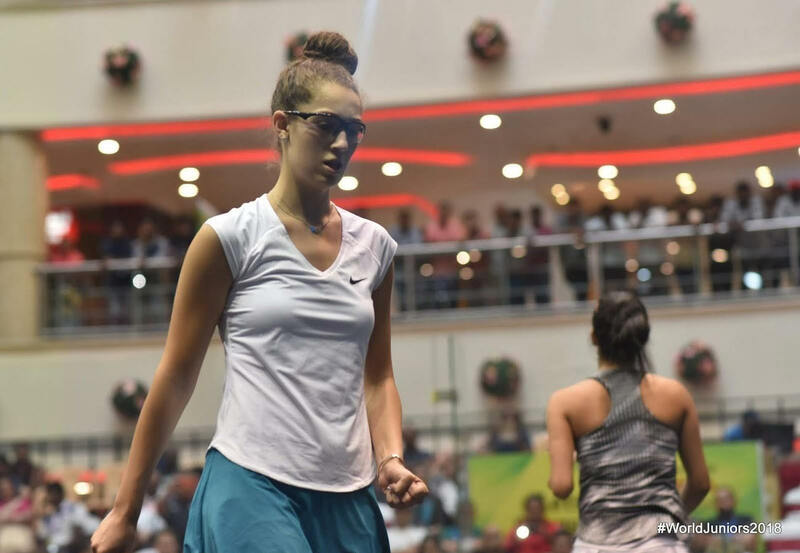 Beaten finalist last year, Hania will meet Marina Stefanoni in the Mall after the US 5/8 seed beat Georgia Adderley in four tough games, the Scot just failing to finish off a fourth-game comeback to force a decider. 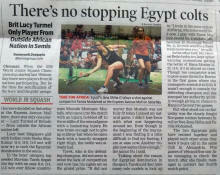 Singapore’s Sneha Sivakumar came through a five game thriller against Ingy Hammouda to take out a second seed in a row. 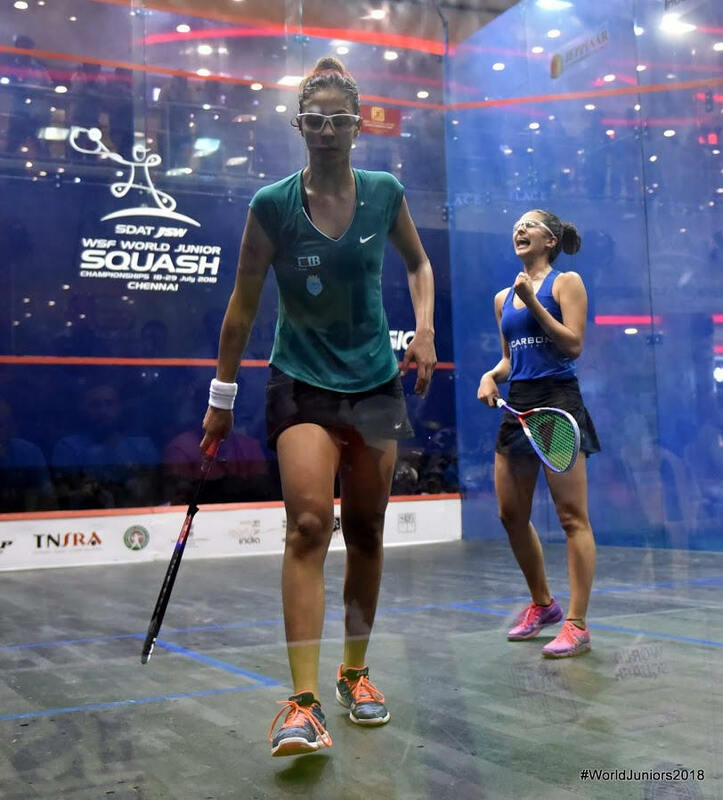 “I didn’t think I had a good draw,” said a delighted Sneha, the first Singapore player to reach this stage since 1983. 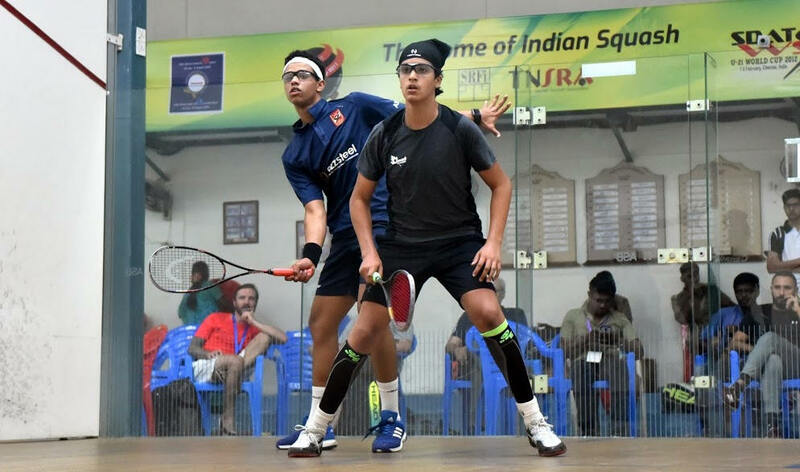 “But it worked in my favour after two tough matches yeaterday and now I’ve got this far without meeting a top four player. 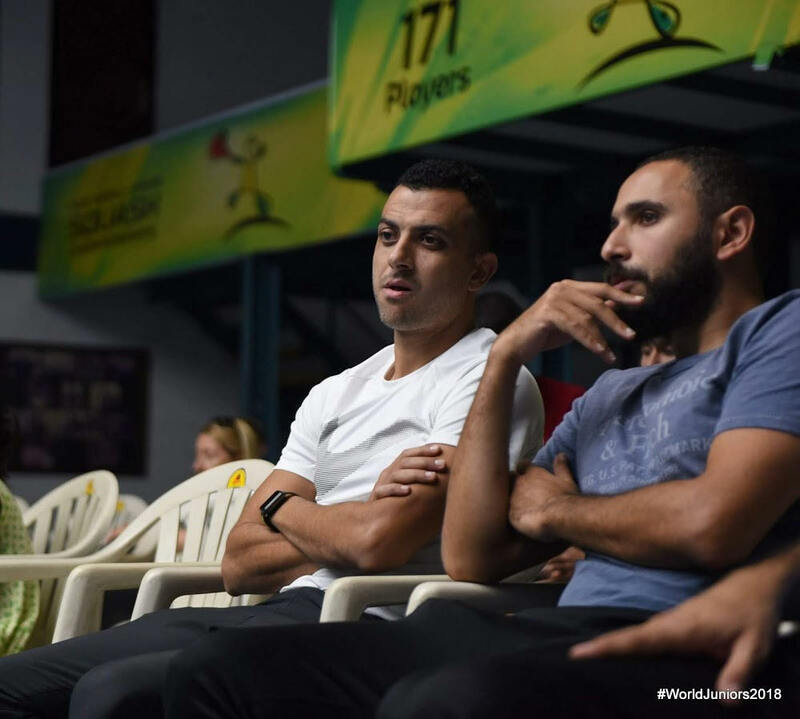 In the men's event, top seed Marwan Tarek dropped a game against Canada's George Crowne, but was happy with his progress: "I think I've played better each day as I'm getting more used to the conditions," said the defending champion from Egypt. "Now for a practice at the Mall!" 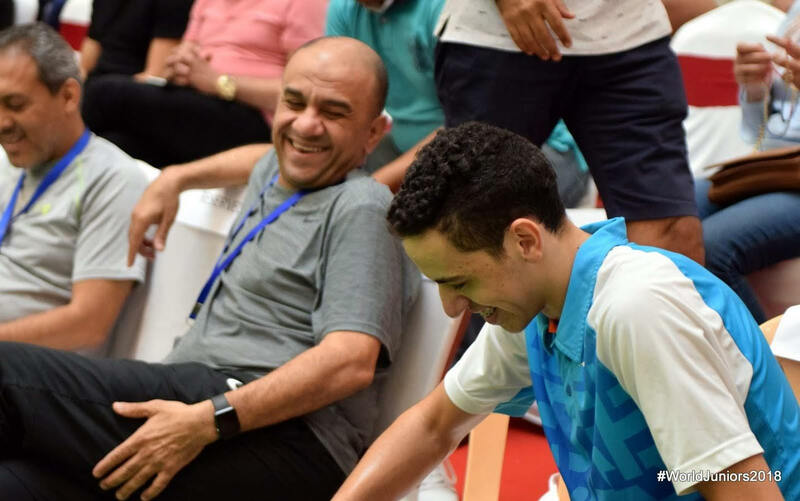 The 18-year-old from Cairo will play fellow countryman Mostafa Montaser, who survived a torrid five-game battle against compatriot Yehia Elnaswany, saving a match ball before taking the decider 12-10. 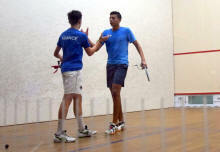 At the other end of the draw, second seed Mostafa Asal also eased into the last eight. 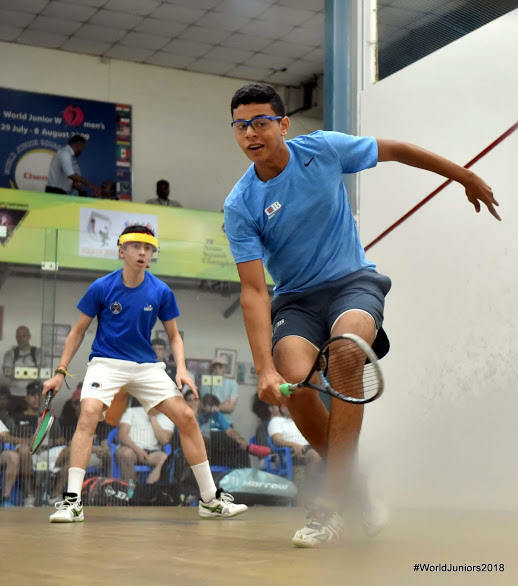 The 17-year-old from 6th of October City, the highest-ranked player in the championship, defeated Swiss opponent Yannick Wilhelmi 11-9, 11-5, 11-8. 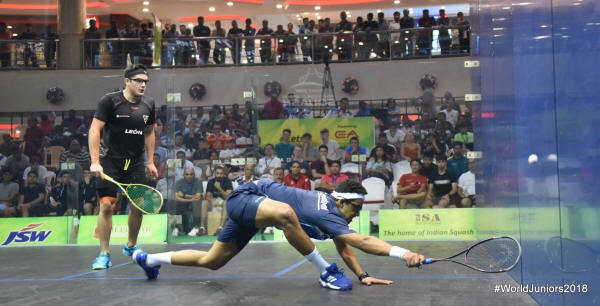 The world No.71 will now line up against the event's sole remaining Mexican Leonel Cardenas after the 18-year-old 5/8 seed, ranked 39 places lower, overcame Canada's unseeded James Flynn 11-7, 8-11, 11-5, 11-3. India is fascinating and the court in the Mall looks fabulous. I'm happy to be in the quarters and looking forward to playing there tomorrow! 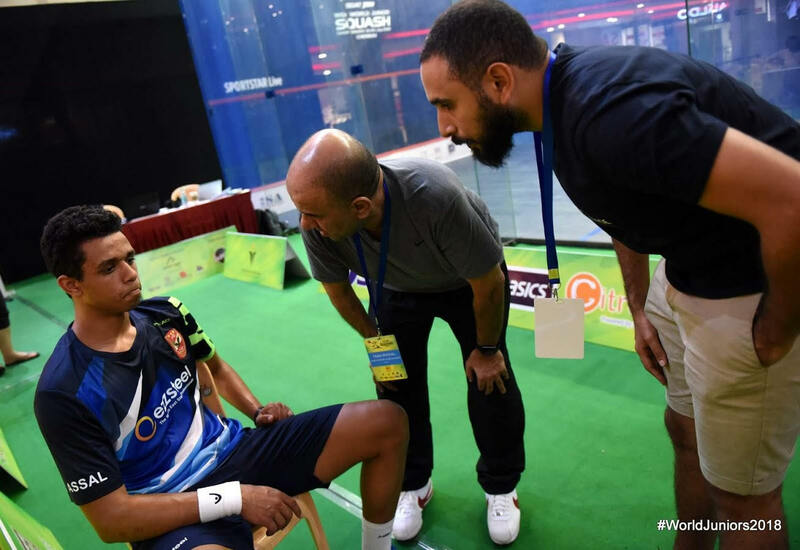 “I lost leads in all three games but managed to get back to my game plan. 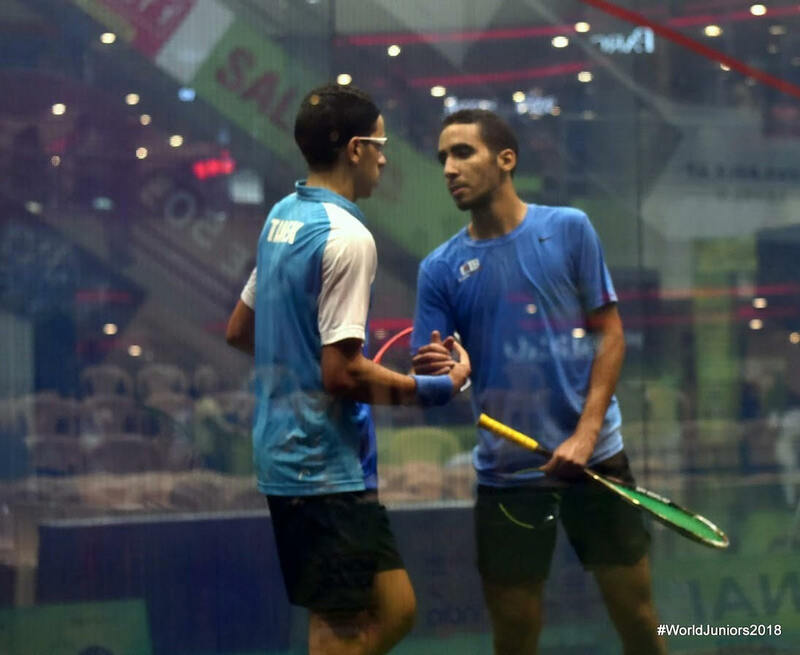 I’m happy to get to the quarters, it will be first time I’ve played on a glass court in a Mall, it should be a great experience. "I think I've played better each day as I'm getting more used to the conditions. "Now for a practice at the Mall!" 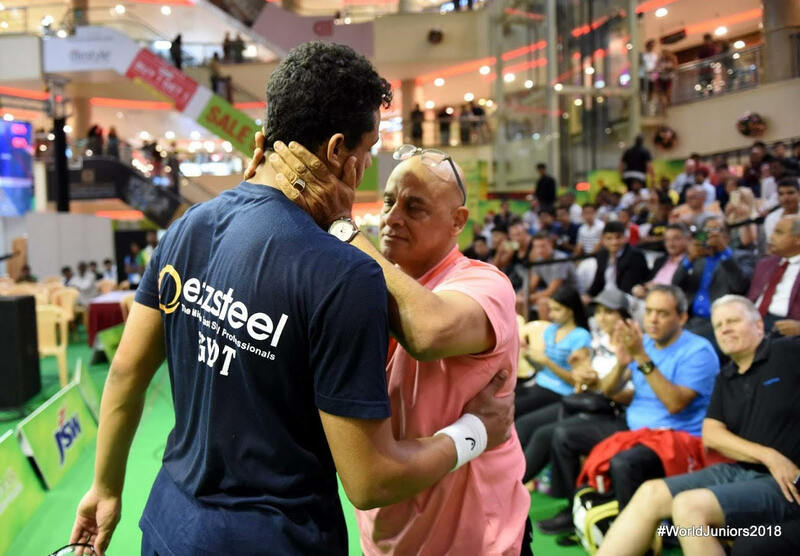 "It was so hard, we haven't played for two years, but he played so well and I was lucky to win in the end. 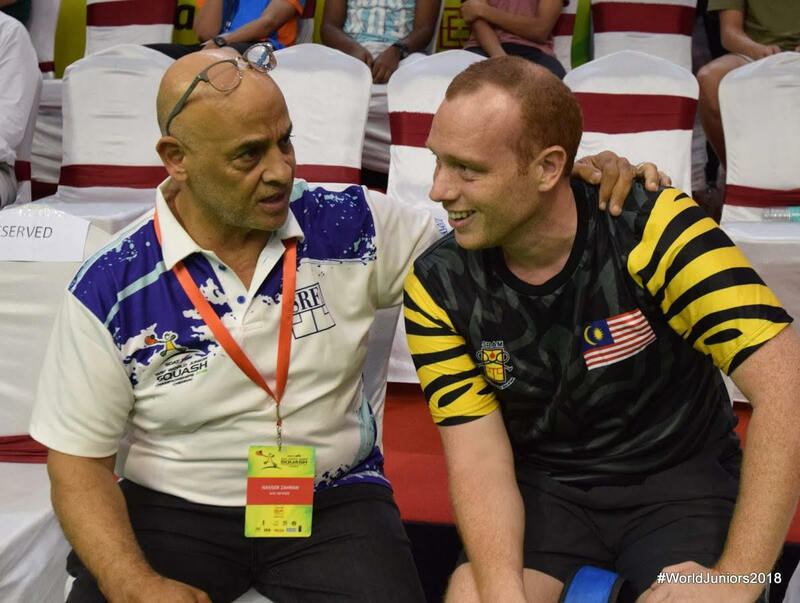 "Hopefully I can be lucky in my next matches and this will be just the beginning!" 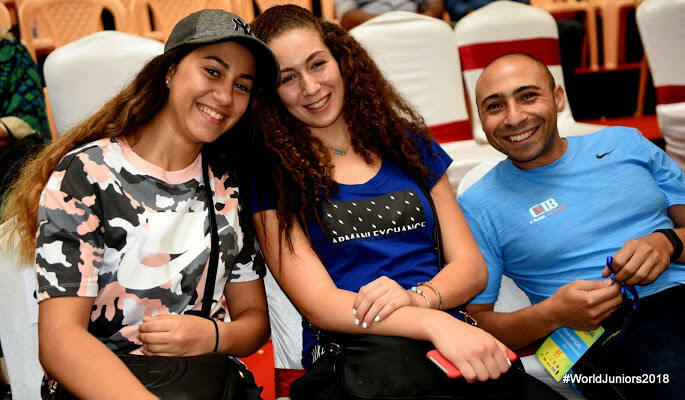 After two rounds of play in the women’s draw top seeds Rowan Elaraby and Hania El Hammamy remain on course for a repeat all-Egyptian final, with compatriots Hana Moataz, Jana Shiha and Ingy Hammouda also progressing. 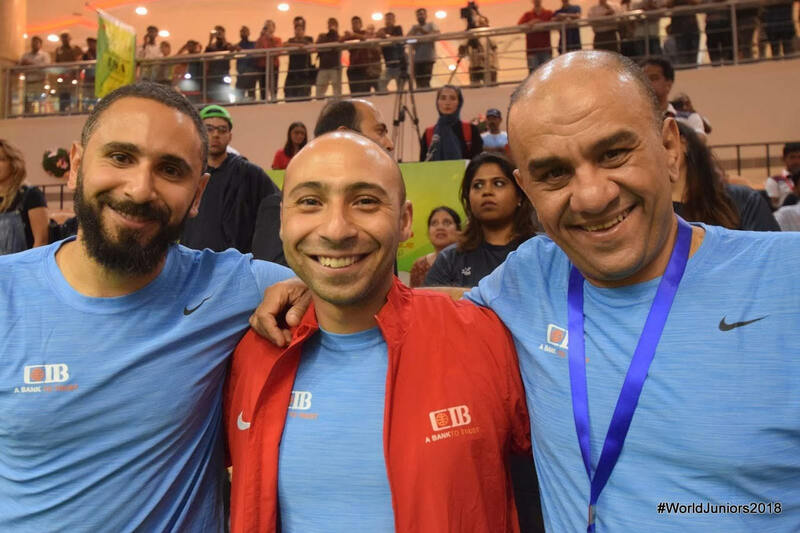 Egyptians were dominant in the men’s matches too, with top seeds Marwan Tarek and Mostafa Asal joined by compatriots Yehia Elnwasany, Mostafa Montaser, Omar El Torkey and Mostafa El Serty as they close in on predicted all-Egyptian semis. 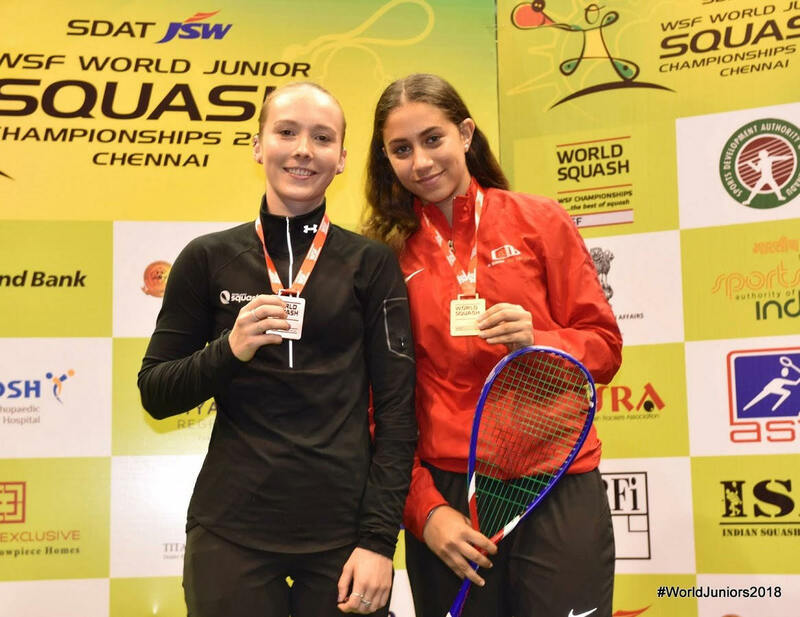 171 U19 athletes from 27 countries are competing in the premier annual World Squash Federation junior championships for men and women in Chennai today. 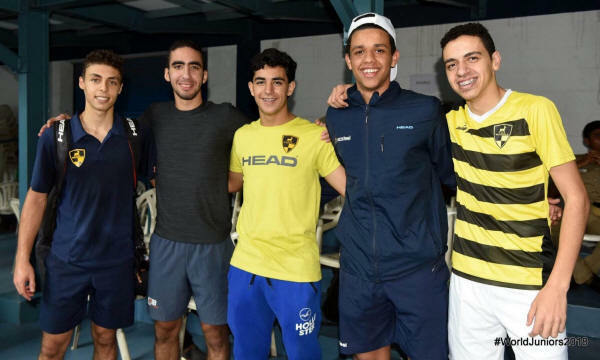 Only the Boys will then continue for the World Junior Team Championship from 24-29 July. Defending champion and event favourite Marwan Tarek led all the top 16 seeds safely through to the boy's last 32 round. 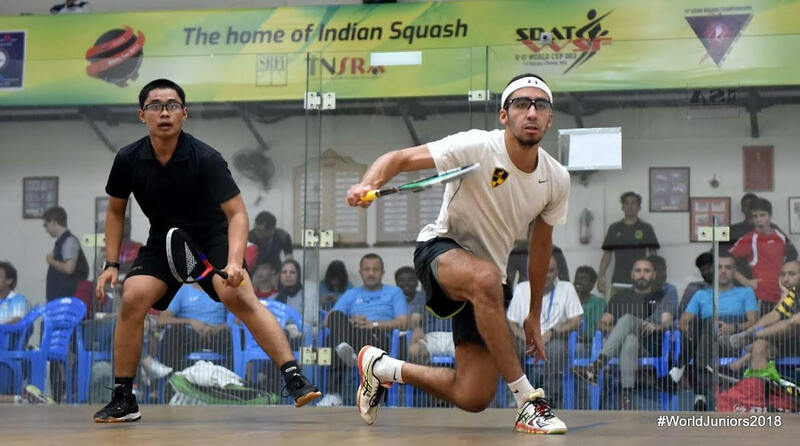 He began his title defence with a straightforward 11-5, 11-7, 11-7 second round victory over local player Advait Adik. 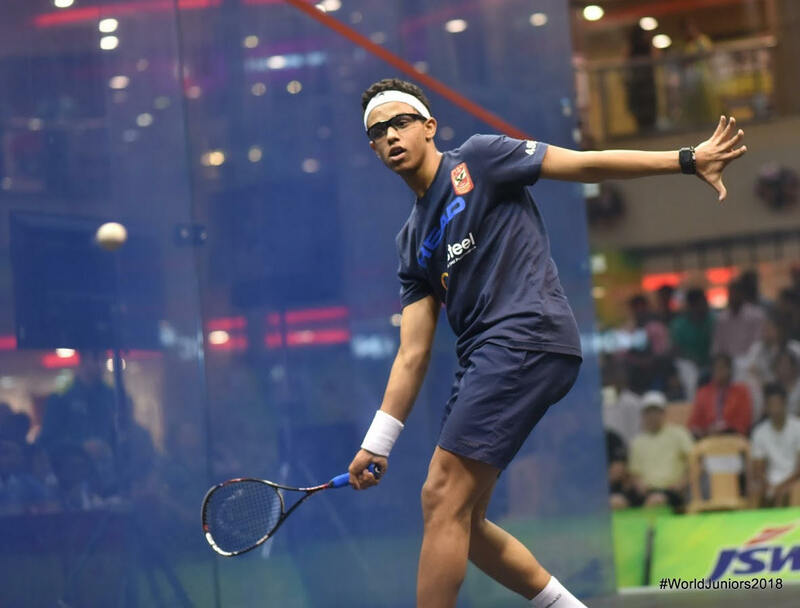 The 18-year-old from Cairo now faces Malaysian Muhammad Amir Amirul Azhar for a place in the last 16.